I was going to have a Tummy Tuesday post today, but haven't got photo capabilities installed on the new computer yet. New computer? Yes, we broke down over the weekend and bought a replacement desktop. We thought we had better hurry because of the rapidly decreasing likelihood that we would find an XP box for sale, not wanting to deal with Vista for at least a couple more years. We got lucky and found a refurbished HP media box in the clearance section of Micro Center. It's very similar to the "dead" box, with the essential things (XP, card reader) but not most of the bells and whistles (TV tuner). I haven't given up on the old computer, though. I think I have most of my documents and photos backed up, but DH has some photos that are not, that he would really like to recover. So today I hooked up a USB-to-SATA cable to take a look at the hard drives. They're perfectly functional, but I can't get the data easily because we have two RAID 0 drives. Having done a little more reading, I am kicking myself for buying this option. WHAT WAS I THINKING? RAID 0 stripes the data across two drives, making it extremely difficult to recover once disconnected from the computer, and providing no protection against data loss if a drive fails, anyway. Dumb, dumb, dumb. But at least I have confirmed that the drives are not the problem. Next I called a local repair shop, who said they would be happy to look at my dead computer in a week or two, but did not seem optimistic that it could be repaired for less than the cost of a new computer. While I was deciding what to do, I powered up the old box to see what would happen, since it was open. Whoa... it starts. Windows runs. Everything looks normal. For about 2 minutes, then I smell that faint burning odor and the power cuts off. I don't see anything burning, melting, or smoking, but the power supply is very hot and I don't recall seeing the fan running. OK, I'm going with a faulty power supply. A new one is on order from HP. I'll leave the old box reclining on the operating table, and we'll see what happens in a couple of days. Again, any advice is appreciated. At the end of last week I discovered Joshua Nemith's Cincinnati Pianist Blog, and more specifically, I discovered a post he wrote in June that contained a detailed description of how to break Bach's 2-part invention in C major (for keyboard, obviously) into chunks in order to learn a piece of music that can't be digested in one fell swoop. Whew, that was a mouthful. Josh (if I may refer to him in the familiar) was kind enough to answer a couple of my questions regarding his approach (note to Cello Chatters: he did not tell me to go get a teacher - how refreshing) and I came away totally psyched to try this out. As you know from reading my cello posts, I'm at that developmental phase where I am really struggling with the transition from working on music I can already (almost) play, and music for which I have (most of) the technical skills required but the piece is too much to play it right off. This looked like an ideal laboratory for trying out the chunking approach to learning this kind of music. Partly because I love the Bach 2-part inventions. In fact, other than using keyboard skills to assist in ear-training and learning cello music, playing them is my primary goal for learning to play the piano at all. On the second day I had the idea of recording the chunk I was working on at the end of each practice session. I think it will be very cool to have that available to assess how this whole thing worked for me later - when hopefully I have mastered this piece. On the third day I had the idea that a "social network" on Ning would be a great place to set up a practice log - so today I did. Now I have an audio player which will list each day's work. I'm using my Edirol R09 to record instead of my minidisc player because it is dead easy to put the SD card into my computer's card reader and upload the mp3 directly to Ning. Woo hoo! So without further ado, here is my practice log. A note for the observant: this log will magically update as I add new recordings to the master player on my practice log. Yesterday was my first adoption event. The rescue group that I am fostering Sharae and the Country Cousins for holds these once or twice a month at one of the (many) local Petcos. Three hours on a Saturday, 45 minutes of travel time on each end, plus we needed to stop at the vet beforehand for Sharae to have one more blood test done. It was a very full day. I'm not sure how effective these events are at getting cats adopted. 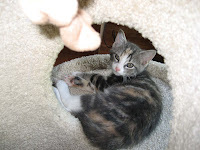 It seems to me that PetFinder is much more efficient at drawing serious adopters, but it is a chance for the foster parents to have a little social event and meet each others' kittens. Cat people love meeting kittens. And I suppose it is also a neutral place for pre-identified potential adopters to come and meet the kitties who are out in foster. I know that's what I tried to do before I adopted John. Tried, because he was unfortunately not at the event that I attended, but I did get to complete my screening there to facilitate meeting him later at his foster home. And wouldn't you know it, there was someone just like me there. 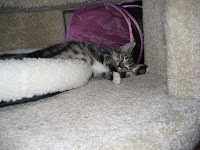 She has two older female cats, and was looking for a younger male to balance out the household personalities. She had been thinking and looking for a year, and had been previously screened and approved as an adopter, so had come out to see who showed up, and if anyone was "perfect." Wouldn't you know it, the only cat who was adopted yesterday was QT. Yup. He was "perfect." I was totally unprepared. D- threw a whole list of last minute reminders at me, things like preparing paperwork ahead of time and making up little adoption baggies with a favorite toy and some of the food the cat is currently eating. Feeling overwhelmed (my first time, after all) I decided to let that slide this time because the chances of one of my kittens being adopted was so small. The girls weren't allowed to go for a few more days because it was soon after their spays, and I was really hoping the boys would go with the girls. Oh, well. 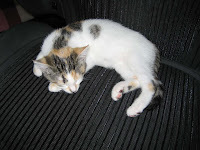 The adopter seemed really nice, was ready to adopt, pre-approved, and had cats to keep a kitten company. I think QT was an excellent choice. 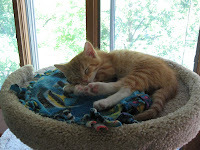 He has lots of kitten energy, but a very mellow personality. He'll miss his sibs for awhile, but I'm sure he'll adjust quickly, and that his new family will just love him. And I did have one of his favorite mouses (a red one) with me so that I could send that with him to his new home. But I do miss him. My Mom (who is visiting) cried a little when I came home without him. 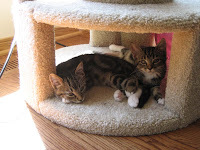 The sibs are adjusting well, no seeking cries, but they do seem a little subdued. J-, I forgot to tell you that he loves to roll on his back and have a hands-around-the-belly rub. But you've probably figured that out already. I was going to say it's been one of those weeks, but I don't want to generalize. The Country Cousins had their spay and neuter date on Wednesday. Procedures went well, but they came home hissing and spitting. Especially the girls. Can't say as I blame them. 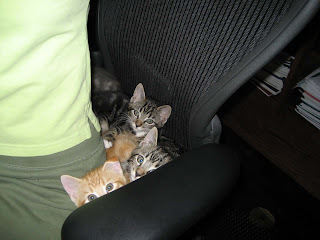 The guys may be squeamish about the neutering procedure, but male kittens barely notice it. They're just glued together, in fact. I think one of the reasons it's worse for the girls, in addition to it being an invasive intra-abdominal procedure, of course, is that they are under anesthesia longer. Anesthesia makes people crazy, and it makes cats crazy. One of my favorite memories from medical school is of a lewd, uninhibited septuagenarian as he was coming out from under anesthesia. I thought of him as GiGi was making for the steak on my plate on Wednesday night. They also remind me of students who have gone off to school and come home swearing. Maybe they were contaminated by their contact with other foul-mouthed kittens at the vet. A loss of innocence. This weekend we have a visiting kitty. Her name is Poppet, and she has only one eye and a bit of an attitude. I'll tell you more about her some other time. 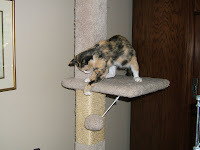 The reason I mention her today is because she is a hiss and spitter, too. May be genetic... she is actually an older half-sib, or whatever you call a kitten from a previous litter, of the Country Cousins. So it's anything but dull here. Hiss. Spit. Akhkhkhkhkh. Taking a break from Harry Potter. Whew. I don't know if I can stand this amount of intensity in every chapter. BTW, PFS, I had pre-ordered my copy from Amazon back in February. Love the convenience of having it delivered to my door, even though it means I'm 12 hours behind when I start reading. And I actually didn't have a chance to start until evening, which is why I'm only half-way through. Sleep is important. One of my favorite Harry Potter memories will be the anticipation of the book arriving by courier on release day, as I have done since 1998. Which book was that? All of my past week was not spent flogging the computer issues. I had a pretty busy play week, too. On Friday and Saturday I got together with special music buddies to play cello trios, sonatas, piano trios, and string trios. The highlight was playing through some pieces written by Roger Bourland in the last decade or so that I had recently invested in upon Elaine Fine's recommendation. We read the cello quartet, with me alternating between cello 2 and 3 since we were short one, the piano trio, and one of the sonatas. After reading, the universal consensus was that these are really fun pieces. They are technically within reach of good intermediate cellists, but will benefit from some thought and elbow grease. Everyone wanted a practice part so that we can work on them in the future. On Tuesday and Wednesday my orchestra had our summer noon concerts. Both concerts were outdoors, on different parts of the University grounds. We split the music I listed earlier between the two concerts, with some duplication, and on both days had more scheduled than we actually got through. It was a lot of music, and I can admit here that I was not very proud of my playing, especially the second concert. It was very hot, we were on concrete, and under the tent the heat seemed to reflect off the ground to be trapped there with us. I was physically exhausted. Orchestra season is over, to resume in September. Cello lessons resume in October. I'm waiting to really want to play before I resume an intense practice schedule. Occasionally I wonder if one of the reasons I don't feel much like playing is that I don't have a very good cello to play on. My replacement is still waiting for the varnish to dry, somewhere in a very wet summer in England. In the meantime I'm practicing my cello desultorily, but spending more regular time on my piano lessons, which end next week, and a little ear training. I'm thinking about trying a beginning vocal class in the fall. And I'm enjoying summertime. Well, it's been a week. I think I mentioned before that we finally got a piece of furniture to house the computer and eliminate the kitten-engulfing rats' nest of wires surrounding the desk. Looked nice, too. I have learned from hard past experience to label both ends of each wire before disconnecting things, and though I still had a big pile of wires inside one section of the case (need shorter cables) reassembly was relatively straight-forward. Unfortunately, even with all cables apparently connected correctly I had lost Internet access. Cable, modem, router, oh my. I felt fortunate when IE7's self-healing capability got the main computer back on the 'net. Alas, nothing worked to re-establish the connection for DH's laptop. Very annoying. Both computers use a wireless connection to the router, both read a strong wireless signal and claimed to be connected, but the little 'puter just couldn't see the web. We even went to great lengths to upgrade IE to v7 (he usually uses FireFox), quite a feat without an Internet connection, but self-healing was not achieved. Oh well, he was leaving on a business trip, and we set the problem aside until his return. Then he called to tell me little 'puter was belly up with a BSOD. Lousy timing, and he was scrambling to get his presentations together without it. But it gets worse. On Thursday I was writing my blog post for the day when I smelled a faint odor of electrical burning. 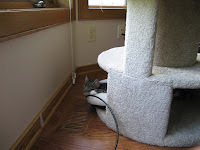 It seemed to be coming from the general direction of the bathroom (AKA The Nursery), where the newly-installed fan had been running non-stop for a few days (a definite boon when the kittens have diarrhea). I thought a few choice words about shoddy manufacturing, turned it off, and the smell of burning abated somewhat. I felt around the ceiling, and nothing was hot, so put it on the list of things to discuss with the contractor. An hour later, the main computer abruptly shut down. Apparently the odor was being pulled across the room by the fan, and the decrease just meant the smell wasn't reaching my nose. So now I get a start-up screen and the computer immediately shuts down. This does not look good. I was amazed at how much I got done last week without e-mail and blogs to distract me. I briefly entertained the possibility of not replacing the computer, and while I quickly came to my senses I really need to take a hard look at how I'm spending (wasting) my time. While traveling this weekend it took about an hour on a WIN98 box to re-set Blogger to directly publish my posts via e-mail. (Is it my imagination, or is dial-up getting slower and slower?) Anything you read for the next while will be from my (so far) trusty Treo. That reminds me... I can post from the Treo, and read comments because they are forwarded by e-mail, but I can't access or enter comments on Blogger. Please don't think I am ignoring your comments. I have greatly enjoyed those entered this week, but lack the ability to respond. And I apologize in advance for the numerous misspellings you are sure to see, between the tiny type and lack of spell-check.. 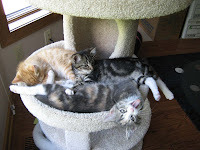 The Country Cousins' diarrhea has not resolved completely, but has improved to the point that not only do they have good bowel control and litterbox-seeking behavior, never really an issue, but they are able to cover the stool and leave the box without getting poo on their feet and tracking it through the house. 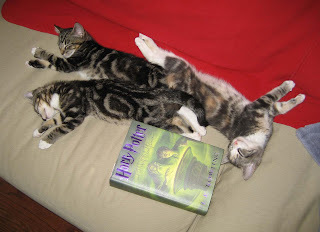 As such, they were granted nocturnal whole-house privileges a week or so ago. When I first leave the office door open at night, most kittens will still seek the familiar and sleep upstairs. These kittens followed the usual pattern, discovering the expanse of the downstairs frontier after a few days, then figuring out how to climb on the bed, finding the big cats sleeping there, and finally - oh joy! - MOM! It's a little crowded on the bed these past few days, though Cricket has elected a change of venue to the closet hallway, temporarily, I assume. That leaves John and 5 kittens. I am forced to admit that on a couple of occasions I have returned to bed after a 2am nature call to find that there was no room for me to squeeze back in, human pretzel that I am, and relocated myself to the couch. Now, don't snort with disgust and tell me to just throw the kittens off the bed. (And if you believe cats shouldn't be on beds in the first place you are obviously reading the wrong blog.) Waking a sleeping kitten at 2am initiates a domino effect. He starts playing, wakes up all the other kittens she can find, they wrestle and pounce all over the bed, and either wake you up or keep you from going back to sleep, too. 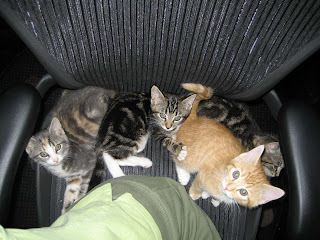 You become greatly annoyed, scoop up all the kittens you can grab, toss them out of the bedroom and close the door. They spend the rest of the night scratching and crying at the door. 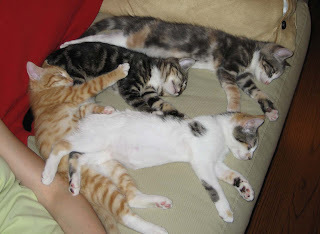 Trust me, it's easier to relocate to the couch for those last few hours and let sleeping cats lie. While DH is traveling we have the whole bed to ourselves, and it's fairly easy to reposition myself around half-a-dozen kittens in the middle of the night. But then there are half-a-dozen cats on the bed in the morning, as breakfast time approaches. I am not an early riser (have I mentioned that?). Someone should warn you before you go to medical school that doctors go to work awfully early in the morning. As a natural night owl I spent nearly 3 decades trying to not do something stupid before 9am, but no more. I love retirement. I do find I get up a little earlier when I have kittens in the bed, especially on the long summer days when it gets light so early. They don't pester (not tolerated) but what they do is nearly as exasperating - they keep checking to see if I'm awake yet. They perch themselves on the pillow beside my head and on my chest and stare intently at my face, searching for signs of alertness. And purr. Loudly, in stereophonic surround sound. Not the worst alarm I've ever woken to. Just a quick follow-on to yesterday's post. After watching the first three Harry Potter movies during the weekend Potter-a-thon, I decided to re-read ...The Half-Blood Prince (book VI) in preparation for the release of ...Deathly Hallows (book VII) next weekend. I grew out of the belief that reading Mademoiselle would make me gorgeous by my mid 20's, but even at my more mature age continue to battle with the magical thinking that if I just buy the right book I will become smart. Unfortunately, DH shares that fault. In medical school we had one complete shelf for neuroanatomy books, and another for biochemistry texts. Every time I take up a new hobby you can read clear evidence of it on my bookshelves. I would estimate I have 20 linear feet of computer manuals and how-tos, and maybe 8 linear feet of music texts. Previous hobbies (ice skating, wind surfing, squash) have been recycled at library book drives. 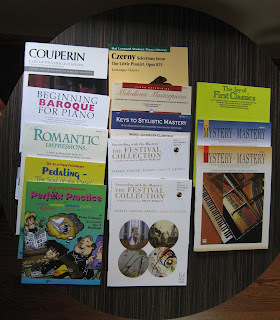 The music books are harder to estimate, as many are over-size and are filed in a pile on the bookshelf. And I'm not sure I can accurately estimate the amount of sheet music I have. At least 4 file drawers and several shelves, plus 20 or so CD volumes. It boggles the mind. I try to keep it in check, but have yet to completely shake the habit of buying sheet music on spec. "Oooh, this looks interesting... I think I might be able to play it someday!," and it doesn't seem to matter whether I am browsing at the store or on the internet. The only reliable solution is to refrain from browsing. So, yesterday I stopped at the sheet music store on my way home from my AT lesson. My specific goal: to find a volume of elementary canons and fugues to play on the piano. I love fugues, and my appetite to learn how to play them was whetted by a little 5-finger canon we worked on this week. Lovely warm-up, transposed to major keys last week and minor keys this one. I was hoping to find some graded work to span the chasm between that and Bach 2-part inventions. The good news is that I invested in a number of very interesting-looking volumes (shades of PFS here). The bad news is that I believe there is exactly one elementary fugue in all of these volumes. Which I am greatly looking forward to playing. I think I am going to end up writing my own and playing them. Perhaps I can write out some of the simple canons in my string books to learn with two hands on the piano. Too bad I didn't think of that before I went to the store. I took so many good tummy shots this weekend it was hard to choose. Or perhaps I should say rather that so many tummies were offered to the camera this weekend that I had trouble deciding what to feature on Tummy Tuesday. Here are three Cousins plus Sharae demonstrating their excellent Couch Potato potential, facilitated by a weekend Harry Potter-a-thon. (The other Cousin is on my other side.) Four tummies in one shot. Got a new toy in the mail yesterday. 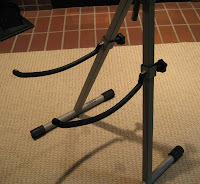 While I was at Shar looking at the orchestral parts on CD-ROM I saw their cello stands were also on sale. I've been meaning to get one of these for ages, knowing that unpacking and repacking my cello into the case makes me less likely to practice for short sessions, which decreases my practice time overall. 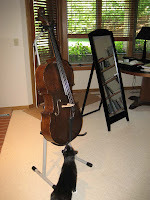 Leaving the cello out free is not an option with kittens in the house. This stand is quite nice, an Ingles. Very sturdy. Unfolds and screws together, no significant assembly required. A cradle to stabilize the neck. 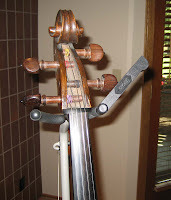 The cradle has a latch on a pivot to surround the neck and inhibit the cello falling off the stand after a simple bump. 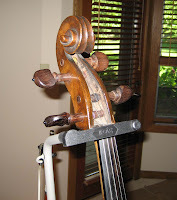 The arms that hold the bottom of the cello adjust in height so that I can leave the endpin out, another boon for the 5-minute quickie practice session. Having the cello higher on the stand also decreases vulnerability to kittens, since it's above their heads and they tend not to notice such things. John displayed the requisite interest in a new object and went on his way. There's a little hook on the back for the bow, but that puts the swinging tip at a tempting height from the floor. Might have to forgo using that. And here's Emma, patiently waiting for play time. This stirred a memory, and yes indeed, I did see Ingrid sitting on just such a stand. You can ask PFS or Guanaco why she's hanging out with that rock-n-roll dude. And one final feature: a lovely packing box. Question: What's one clue that the ordinary-looking person sitting in that office chair might be a 'cello player? 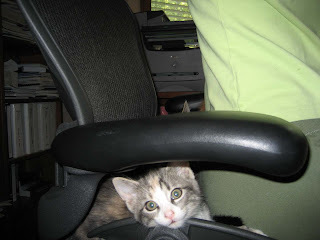 Answer: There's room for napping kittens behind her on the chair. For the non-cellist readers, the explanation is thus. 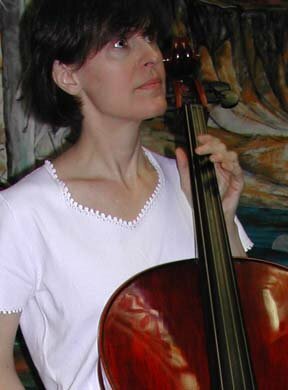 When I play the cello I sit well forward on the chair, balanced on the bony protuberances at the bottom of the pelvis commonly called the "sit bones" or "sitz bones" and less commonly by their anatomical name, the ischial tuberosities. Some players, particularly bigger guys, can achieve a free and balanced sitting stance all the way back in the chair, but not I. It's evidently become a habit I don't even notice, until I discover that four Country Cousins are taking a nap behind me as I type. The church service was the annual "God and Country" service in honor of the 4th of July, patriotic songs with elaborate orchestral arrangements and a little drama introducing the history of each song. When I was word-searching for the appropriate descriptive term DH suggested "schlocky," which I think was just about right. As expected, he loved it. And though it's not my favorite thing to play, I enjoyed having an appreciative audience. The congregation was huge this week. I did limit practice times to less than an hour each day, and discovered I must have built a pretty good base in the last five years. Although my playing is rusty, I felt quite competent and best yet, none of my nagging chronic overuse injuries have flared. Right now my mind is proceeding along two paths of inquiry. The first is re-thinking my scales routine, and figuring out exactly what I want to accomplish with that in the next three months. The second is a retrospective look at my practice journal, very underused in the two years I have been studying with T-, in order to figure out where I want to go with that from here. You can expect my upcoming posts to perseverate a bit on those two topics.